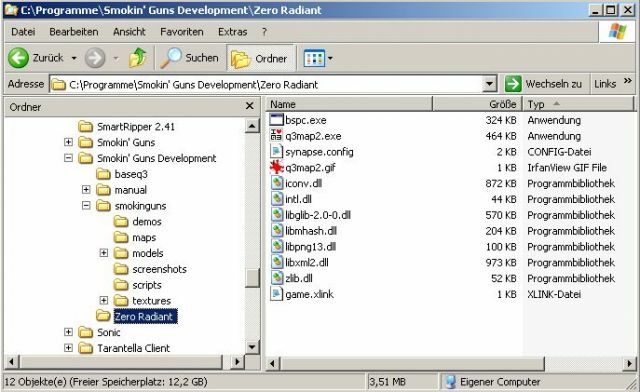 This tutorial explains how to setup Zero Radiant (aka as Radiant 1.6) for mapping with Smokin' Guns. Zero Radiant is a fork of the GtkRadiant 1.4 codeline and fixes several bugs. Thus, it is a little "fresher" than version 1.4. On the downside, however, a few plugins (such as brush cleanup) are still missing. For more information see Zero Radiant Page. ZeroRadiant is still under development and, thus, there is little support! Please also take note that most of the team is still using the "old" GtkRadiant version. It is strongly recommended that you stick to that version if you are new to mapping. We might not always be able to help you with the ZeroRadiant version if things go wrong. Check out Pardner's great tutorial for setting up the 1.4 version of Radiant. c:\Program Files\Smokin' Guns\Development -> Mapping "clone"
Please note that you will have to make changes along the way if your paths differ from mine! First, you will need a clean (and functional) Smokin' Guns installation. You can simply "copy" your Smokin' Guns directory and rename it. However, please be sure that it is still clean and not messed up with any additional things that might not belong there. If in doubt, get a fresh download from our mirrors and extract it to a SG development folder of your choice. 1. 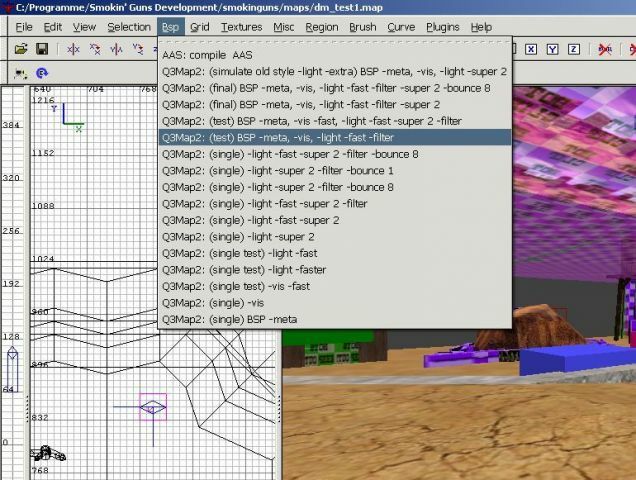 Extract the contents of SG Zero Radiant Mapping Package.zip into the temporary directory: The package is pre-configured with two language versions (yes stupid I know) which usually have different paths. I prepared everything for two common installations (C:\Programme ...) and en (C:\Program Files ...) so that it is as easy as possible. Smokin Guns is already selected as the game of choice. Tick the box "Auto load game on startup" and press "OK". Note, that Zero Radiant will complain that a few files are missing. That can be ignored since Zero Radiant will create them now. 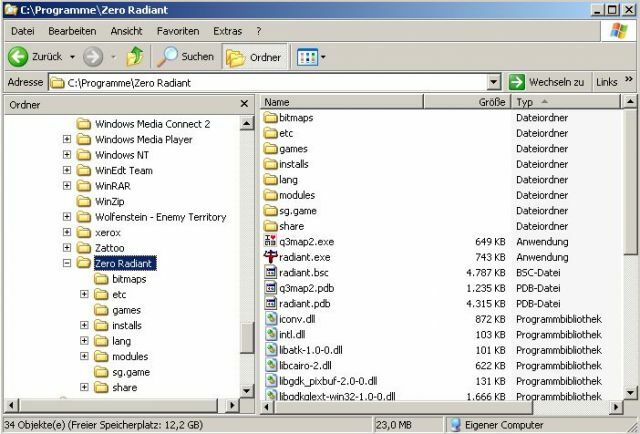 Zero Radiant will output the result of the compilation process in its console window. You can start SG and check the map when it has finished. 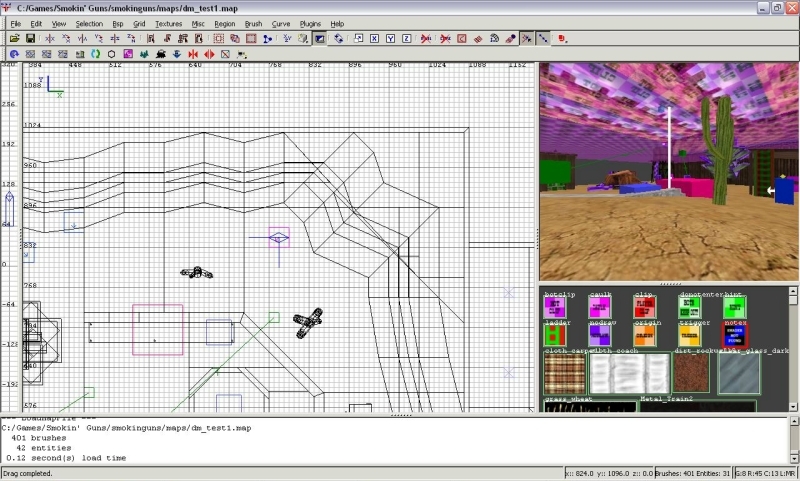 I recommend that you use to Q3Map2Toolz if you are not acquainted with the compilation process and its switches. However, I prefer batch scripts anyway so I shy away from it. I am currently figuring out a way to "hack" Zero Radiant so that I can start arbirary scripts with parameters directly from the menu. Check out this thread for some ideas and some useful scripts. Thats it. So much for the little tutorial ... thanks for reading and let us know if you have any additions or questions.